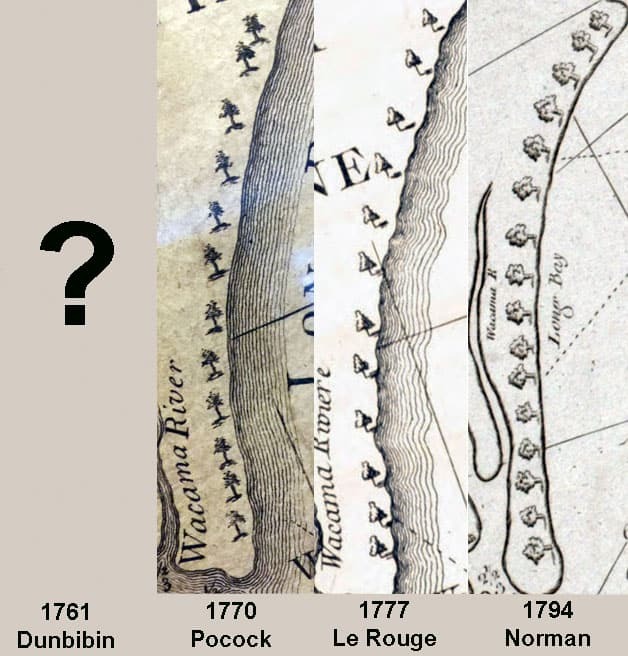 One noticeable feature on a select few Carolina coastal charts published during the last half of the 18th century is a row of trees along the Grand Strand, a section of coast now dominated by high rise hotels and condos. Who “planted” these trees? Daniel Dunbibin or Nicholas Pocock? Image credits: 1770 Pocock image courtesy of Boston Rare Maps. 1777 Le Rouge image courtesy of North Carolina Collection at UNC-CH. 1794 Norman image courtesy of the Norman B. Leventhal Map Center at the Boston Public Library.